When is the right time to start thinking about moving into residential care? Christmas can often be a time when the big decision on whether the time is right for a move to a care home and, if so, where to move to becomes a hot topic of conversation. Spending time with an elderly parent, aunt, uncle or friend over the festive period makes relatives realise that they are beginning to struggle to cope at home on their own and the time for a move to a residential care home is approaching. It’s not often that people choose to move into a care home like Fairfield without there being an underlying reason for giving up their home. Catalysts for a move can include the death of a partner, a fall or operation or just a general decline in mobility that makes it impossible to climb the stairs or to get around the house easily. When the task of making a cup of tea is not just challenging but potentially dangerous, loneliness is becoming an issue and getting to bed is a struggle, then maybe the time is right to start thinking about moving into residential care. Going into a residential care home is a major change and a commitment that needs much consideration and research to find the right one for you or your loved one. It means moving into somewhere that is not your family home, even if it is located in the same town or neighbourhood. 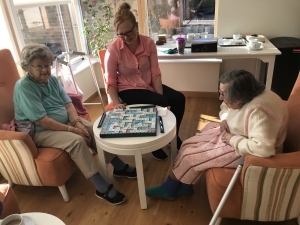 It is also important to find somewhere that offers the level of care you require ie general care, nursing care or dementia care and somewhere that offers the right level of activities, outings and visits. A care home like Fairfield provides personal care that means the staff can help with things like eating meals, personal hygiene and washing, going to the toilet and taking medicine. Everything is provided from 3 home cooked meals a day to a laundry service as well as a busy programme of activities to keep the mind and body fit. Of course a key consideration is the cost of being looked after, but this might not be as high as expected if you no longer have any council tax, mortgage or household expenses to pay. On the other hand, it’s also peace of mind for your relatives that you are being well cared for. If you would like to come for a look around Fairfield and meet the staff and the other residents or if you have a relative who may need care, call us on 01865 885413 or email care@fairfieldhome.co.uk.